... 1980 (30 years ago today), just off the side of a dirt road, "in a crude grave 25 miles southeast of" San Salvador, capital of El Salvador, were found the bodies of 4 American women, 3 of them Roman Catholic nuns and the other a lay missionary. 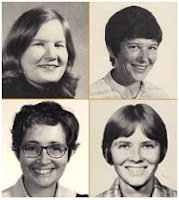 Dead were Jean Donovan (top left) and Sisters Dorothy Kazel (bottom right), Ita Ford (top right), and Maura Clarke (bottom left). Occurring amid continuing political violence in the Central American country, the discovery followed deaths of 11 priests over the course of the year, as well as the fatal shooting of 20 persons in the prior 24 hours. Decades later, as IntLawGrrl Beth Van Schaack has posted, the women's killings were the subject of an unsuccessful Alien Tort Statute suit litigated in Florida. On the Brink of Genocide? Go On! "Law & Memory"
DADT no. Child brides yes. DREAM not.